Strategic Connection is the concept of connecting stones or keeping stones connected in groups. Connected stones gain strategic benefits from each other, e.g. groups can make eyes easier, groups can have more liberties etc... Strategic connection is one of the main principles of basic strategy. The concept comes in two forms, the active and the passive form. At some points in the game it is necessary to spend an entire move just to connect groups to form a single group. This is the active form. The passive form is to avoid plays that result in a disconnection or result in two groups separated by the opponent's stones. Active connection in the strategic sense is not necessarily a solid connection. Often it is a loose connection, where the opponent cannot cut the stones due to the fact that any cutting stone will immediately be captured. Before playing a move that connects your stones it is important to determine which stones are important to connect. Often amateurs attempt to connect stones that have little value. Stones that have a clear function, especially cutting stones are worth connecting. Most other stones can easily be sacrificed. Also when connecting a group, often it is sufficient to connect some or any stone, while each individual stone can be sacrificed for the purpose of connection. ThorAvaTahr: I would like to also address the concept of whole board meta-connection here, if such a thing exists. I am think of two examples. Perhaps the best professional example is the ear reddening move. A move that does not actually connect the weak group, however in the broader sense it does connect the group, since it has made any attempt to capture that group too small in scale. The other example occurs during fuseki, in which both sides set up some sort of framework. The stones that make up the framework aren't actually connected, however, they do receive tactical benefits from each other, which makes invasion less attractive for the moment. I have difficulty finding the right words to describe this, perhaps after a short discussion we can implement a good description here? 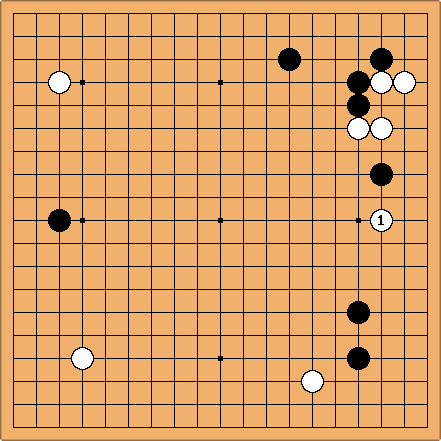 Even though the black three stones are not in danger of dying (even if white gets a stone at black can attach at a and make life) black spends an entire move to actively connect his stones to the solid group at the top left. In doing so he ensure life for his stones but also does not permit many forcing moves against his group. Without these forcing moves there is a lot more pressure on white's three stones in the center.